After much delay, Maxis has finally unveiled its RM199 RM195 HTC Flyer.As what most consumers are guessing, there’s something fishy behind such a tempting offer. 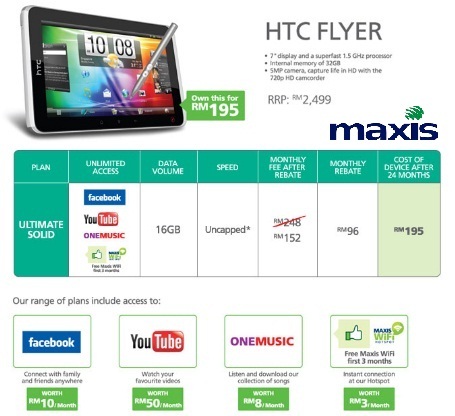 Indeed, you need to subscribe to Maxis Ultimate Solid Plan for 2 years to get this RM195 HTC Flyer. And the Ultimate Solid Plan is not cheap. It’s RM152 a month (after RM95 rebate monthly for 24 months). 4. 3 months free of Maxis WiFi at Maxis Hotspots. What does this mean? It means that you can still surf the above wesbites even after you have reached your quota of 16GB (Who will exceed this monthly quota while on the go? :-P). The worst part of the deal is that you have to fork out the Recommended Retail Price (RPP) of HTC Flyer which is RM2,499 first and you will get your money back in the form of Rm95 rebate for your monthly commitment of RM248. That’s where we get the RM152/month commitment in the first place. Will you purchase this device outright or you will go will Maxis Ultimate Solid plan for 24 months and get the HTC Flyer at RM195? Share your thought in the comment section. Yup. The RRP for HTC Flyer is now RM2,099. Yeah. What you have typed is true but why HTC Flyer? Maybe Samsung Galaxy Tab 10.1? Asus EeePad Transformer is recommended too. They are below RM2,000. Next story Asus PadFone: A hybrid of Smartphone and Tablet, is slated to launch this Christmas 2011!!! Previous story Contest: My Experience with SONY Cyber Shot!